Laura Schmitt NE: Finally, a fish oil the kids LIKE!!! Finally, a fish oil the kids LIKE!!! Well, over the years we have tried many fish oil products. We have used very high quality lines of fish oil with a variety of flavors to appeal to children. While my youngest will take all of them without trouble, the oldest is quite picky when it comes to fish oil. There is no amount of flavoring that makes her forget the texture and taste of the underlying product. So, in an ongoing effort to be healthy, we tried a new product and I am happy and shocked to say that they both LOVED it! 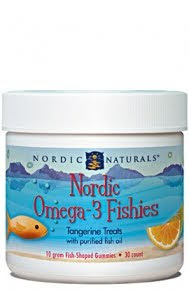 With the Nordic Naturals Tangerine Gummies, the girls are ASKING me for their fish oil. It looks like my ongoing quest for the perfect fish oil for kids is complete. Of course these are gluten and dairy free, which is a must for us. Click here to see nutrition information on this item. In the area? Stop by Advance Health in Cedar Rapids to pick up some gummy yummy Nordic Fish oil supplements for your sweeties!